WASHINGTON (CNS) — Catholic bishops are looking to “transform” Catholic schools in response to decades of declining enrollment that has forced hundreds of schools to close since 2005. The effort, said the chairman of the U.S. Conference of Catholic Bishops’ Committee on Catholic Education, encompasses a wide-ranging look at issues facing Catholic schools and a renewed effort to help parents better understand that the spiritual development of a child goes hand in hand with academic achievement. In an interview with Catholic News Service following a Jan. 17-18 meeting at USCCB headquarters that included 30 bishops, educators and representatives of Catholic education organizations, Bishop Murry said the goal is to ensure that Catholic schools will remain a vibrant and important part of family and church life. Sponsored by the University of Notre Dame, the meeting was the sixth in a series since 2009 looking at the future of Catholic education. Forming the backdrop are sobering statistics on school closings and declining enrollment. Figures from the National Catholic Educational Association show 1,393 Catholic school closings or consolidations from 2007 to 2017 compared with 287 school openings. During the same period, enrollment declined by 19 percent to less than 1.9 million students. Enrollment peaked in 1965 at more than 5.2 million students. — The changing relationship across Catholic school leadership including those between bishop and pastors, pastors and principals, and principals and teachers. — The evolving landscape of Catholic school governance as more advisory boards of lay leaders take shape. — Expanding access to Catholic schools through educational choice. Also underlying the bishops’ concerns are shifting demographics, tuition costs and changes in the practice of the faith, all of which influence whether parents decide to enroll their children in Catholic schools. Bishop Murry said the simple message that Catholic schools transform lives must become the church’s basic refrain. “Pastors with parishes with schools, pastors with parishes without schools, parish school of religion directors have been working together to say it is a genuine value for the future to train the whole person, not just the mind or the body — the mind academically, the body in sports — but also to develop the spiritual life,” the bishop told CNS. “Unfortunately, we live in a very secular society. We are blessed that we’re not as secular as many of the countries in Europe. But we are a very secular society, and fewer and fewer people see the value of that spiritual development. I think that becomes the task of evangelization. Just programs to get people into church are not enough. We have to change hearts. “It’s not simply a matter of an intellectual decision. It’s a realization that I want the very best for my son or my daughter. And part of the best is that that child is eventually in heaven,” he said. Bishop Murry, 69, speaks from experience. His parents, practicing Methodists at the time, took the unusual step of enrolling him in St. Bartholomew School in Camden, New Jersey, midway through his third-grade school year. He recalled that he “didn’t do well in public school” and that the atmosphere at St. Bartholomew turned his life around. He credited Sister Mary Pauline, a member of the Sisters of the Blessed Sacrament, the order founded by St. Katharine Drexel of nearby Philadelphia, for her patience and caring attitude throughout third and fourth grade. “It was Catholic school that helped me to settle down and to focus,” Bishop Murry said. 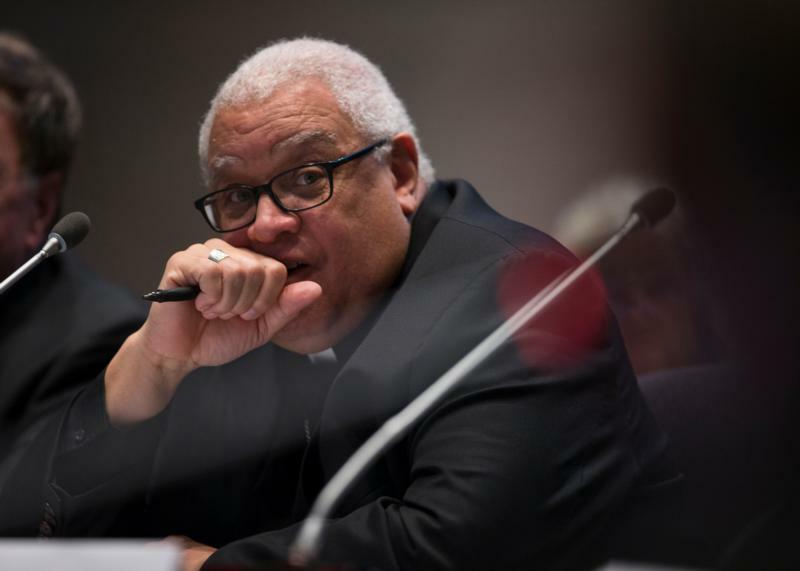 As for rising tuition, Bishop Murry suggested two approaches. The first involves helping parents realize that 27 states and the District of Columbia have legislation providing financial assistance to parents who choose private or faith-based schools. The second requires school leaders and clergy “to be courageous and undaunted in going to donors, people whose lives have been positively affected by Catholic schools and have been blessed with economic security . . . and ask them to give back to Catholic schools,” he said. “[We have] to get them involved, to not be afraid to talk to them and say we need your help in maintaining these schools,” Bishop Murry added. The church also is contending with the growth of charter schools. While publicly funded, charters schools are privately run. They offer parents an alternative to traditional public education. However, oversight of charter schools is spotty and at time lax. Numerous charter schools nationwide have been found to be in disrepair, offer inadequate instructional resources or a narrow curriculum, and lack transparency and public accountability. And at some schools, student performance has been lower than at public schools in the same community. The work ahead is expected to take time to unfold. Bishop Murry said. He hopes that regional or statewide gatherings of bishops will undertake the question of transforming Catholic schools. He also said another national gathering to discuss progress would be beneficial.